The products, experiences and methods discussed on my website are strictly what I learned through my own experiences and through my Veternarian's guidance. I share my knowledge but advise to always please check with your own veterinarian. I always and continue to advise to contact your veternarian prior to using any products you purchase to assure they are healthy for your pets. Always Always think health and safety first when it comes to our little babies, young and old. I not an expert but I have picked up alot of knowledge along the way and I keep on learning to date. Health issues can crop up in canines as they do with people or any other species. I find there is controversy over what is genetic or not. The veterinarian is the best person to go to for these answers, but like anything else you can also get several opinions because veterinarians have their own view point on health issues such as, are they passed on genetically or can your environment be the cause like in chemicals, an accident, injury, so therefore they are not passed on genetically. As a show kennel owner I want to breed the healthiest papillon’s as possible and that should be foremost. At Playful Papillon’s we take trips to the veterinarians office on a regular basis to ensure good health and happiness, when you know your vets phone number by heart that's pretty often! My goal is to OFA test (Heart and Patella's) and CERF test (eye health) at adult age. I also have a goal to not only get DNA samples to the American Kennel Club for the males but also for the females which plays a part in making sure we have accurate purebreds in our breeding program. All my papillons are cleared by testing and parentage testing for PRA1 also known as Progressive retinal atrophy 1 and NAD also known as Neuroaxonal Dystrophy (Papillon Type) I have used a couple different testing facilities such as Paw Print Genetics. 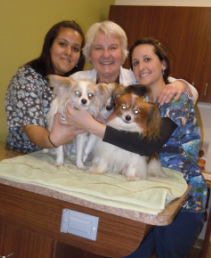 and my veternarian also checks each one of my papillons, eyes, heart and patella's. In addition, micro chipping is important for their safety so as another goal we do want our dog’s micro chipped and require this for any papillons that are rehomed. As you can imagine it is a costly adventure, but this make my little pack as healthy and well cared for , physically and mentally. *CERF - Canine Eye Registration Foundation* is "Dedicated to the elimination of heritable eye disease in dogs through registration and research"
As the puppies get to be about 5-6 weeks old they are getting extra energy to play! I love the energy too ! They are starting to cry to be picked up and in order to give mom some free time I have to keep their doors on the whelping box so she can have that free space around the whelping box...she jumps in and out of it...but two or three times a day I let them run a muck all around her and but within the exercise pen. Click on photo to go to North Star Plastic Website to see this and other products they design! 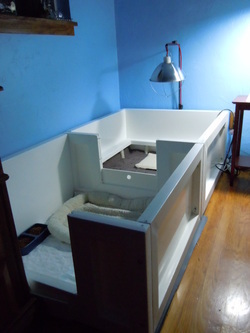 Our whelping box/weaning pen is very easy to setup, use, and clean. Since I have been using it called North Star Plastic's and asked them to divide the weaning area and turn that into a seperate whelping box. For a few $ more they made it work. North Star is very easy to work with. Exercise Pen Whelping Area plus Supplies used at Playful Papillons: When using an exercise pen, I want an exercise pen which is easy to bend over. A good height is about two to three feet tall. Occasionally we have a puppy that likes to climb out of their exercise pen so a cover is needed. Click here to see an example for a exercise pen cover. I typically use an exercise pen that has a door that opens so I can step in and out of safely. I prefer the Midwest brand that is has a black coating. Click here for an example of the style I like. You may want to do a search for Midwest Exercise Pen that has black coated wires. Underneat the Exercise Pen , to protect our floors I use a Heavy Duty Polyethylene Tarp. I place the exercise pen ontop of the tarp the edges extend out of the exercise pen in order to avoid that the puppies or adults can not chew the edges of the tarp. Normally I use a tarp that is large enough to fold in half so you have double protection for your floor/carpet if needed. Click here for an example of what size we may use, it depends on the size of the exercise pen and floor space. I have purchased Veternarian Fleece which can be used in a crate, exercise pen, or as bedding in your home for your pet. Veternarian fleece is pretty costly and also leaves alot of lint in your dryer (and possibly washing machine) when cleaned. It does not stay as pretty and fluffy as when you first get it but it sure does it's job. Vet Fleece keeps your pets warm in winter and cool in summer. If you place a piddle pad under it, fluids can run through it to the pad so your pet stays dry. I have had mine for years and they still work great even though they lost their look of beauty. Click here for an example or look up Veternarian Fleece on a google shopping search. I use Hi Pile Oversized Fleece Throw from Kmart.com or the store. Brand is a Shavel Home Product They have several different designs with animal faces,or other designs. "Plush Fleece Throw Blanket - The plush fleece throw blanket from Shavel Home Products is an oversized blanket that the whole family will enjoy. A border finishes off the beautiful throw that is 80 inches long by 60 inches wide. With its oversize dimensions, it is perfect as extra bedding on a chilly night or for cuddling underneath it on the couch. With its casual style and colorful print, the plush fleece throw blanket easily matches with your home décor. The throw is soft and is made of polyester. When it's time to clean the throw, simply put it into the washing machine. Easy maintenance is great..."
Note: I have used these blankets and washed them time and time again. They stand up to alot of puppy love and they can't tear them up like pet beds. I've even used them to cover pet beds to keep them clean. I would say I still have my original blankets from 4 years ago but keep washing them throughout the year and every year I buy two more. I usually find them at Kmart Store or after christmas you can find them roughly $15 each at www.kmart.com also. My big and little doggies snuggle up in them... Nemo loves to go in circles till he has himself tucked away in the middle on one haha. The prints are mainly animal prints. They just are not too absorbent in case they have a piddle accident but that's what the Medline Sofnit 300 pads are for (listed above). Occasionally the trim around the blanket tears away so I make sure to cut it off where it tears and cut the string also in order to keep the pups safe. ick here to edit. These are the piddle pads I use and I believe are worth it to save the environment from extra waste. These are good for 300 washes and when done with them you can find other uses for them out in the garage. "Medline Sofnit® 300 Reusable Underpads are part of Medline's best-selling line of underpads. This durable, comfortable twill facing underpad resists staining. Vinyl knit barrier withstands the heavy demands of multiple washing and drying cycles while staying soft and leakproof." * Latex-Free * Material : Twill * Size : 34" x 36"
Note: I use these pads when my papillons are inside at night and for rainy days, trips to the vet, etc. From my personal experience these pads last wash after wash after wash, using bleach, detergent and even fabric softner. As they wear down and if holes appear in the pink layer I cut away the pink layer to avoid any injury. I use the white side for a long time thereafter but making sure to cut away loose strings that can be swallowed or the paps can get caught in. Safety is always my first priority. I have considered sewing two white pads (inside out) together as they get older, which will double the absorbency. I'll let you know the results of this test after I used them awhile. I usually purchase two dozen at a time. It is a bit costly and time consuming to wash them but it is environmentally sound and less trash. I keep a couple Snuggle Safe Microwave Heat Pads available for transporting to the veternarian with my papillon. I make sure to add extra padding in the crate because these can be somewhat hot when first coming out of the microwave. I have used them to transport the puppies for vet checks also. It is a very useful pad to have, they are made of a hard plastic and I have used a couple of them for several years. (not often but as needed) ... the heat can last up to 10 hours... which can be a life saver when needing to transport in the car. I have learned to always cut away any strings or freyed edges or fuzzy lint on a blanket or piddle pad. Also if there is a hole in the blanket or piddle pad...cut it through so you have an opening to the edg of blanket or pad and this way you remove the hole. Papillons are so courious and I have had them get into the middle of a piddle pad, since the ones I used are lined and the paps can get in there and start turning in circles and getting themselves very stuck. They can get stuck and even sufficate. I do not give rawhide, cow hooves, antlers, cooked bones, I do not use "Greenies" of any sort. I do give them Bully sticks as long as they do not get to be 3" small, then I toss them in the garbage and I just give it to them supervised. The veternarian that saw Rolly recommended only Nylabone and Kong toys only... not even bully sticks.. I no longer give them​ any squeaky stuffed animals or plastic cruncy bottle animals that you can buy at the pet store. I have had Little Princess chew an electrical cord and plug that was on a fan I had in their room and just heard that Freya, who I recently placed in a loving home, chewed up a lap top cord. I now place electrical cords through PVC pipe that is big enough to have the plug go through. Thank goodness Freya was fine but Little Princess was not herself after chewing the electrical cord and plug so I ran her to emergency and she had an xray. They could not find any foriegn object in her and she started to feel better after a few days but these are things we can try to avoid by adding an extra step to protect our children and pets. Chew Toys - I did a search on Chewy.com (one of my favorite websites for buying dog toys etc) , my search was for puppy chew toys ... I purchased some of the pink and light blue Nylabone teething toys and Kong teething toys for the puppies under 8 months of age. I do not buy any chew toys with strings due to what happened to Rolly intestines. Click here to see some of the types of appropriate chew toys for younger puppies. I was asked about dog shoes to protect your papillons feet, however, i do not have experience with dog shoes, so check with your veternarian about what type of shoes to use for your papillon. Papillon bones take two years to grow. Patellas are something we take extra care and ask future papillon families to be aware of so some safety tips included on papillons of all ages but especially on papillons two years and under. I do not let my papillons jump on and off couches and papillons are so fast you want to be ready to grab them incase they run on your couch and jump off the arm rest or back of the couch. I have heard of papillons dying that have hit the floor hard from jumping off a couch, it is best if you can have your couch backed up against a wall. I also do not let my papillons under two years of age, go up and down stairs. While holding a puppy or adult papillon, I make sure to tell people to hold them like your holding a rabbit because I have seen a papillon jump out of the arms of a young girl and land on concrete, and she was sitting on a picnic table bench also. So everyone sits on the floor and holds them tightly like holding a rabbit. I do not trust my papillon not to jump out of my arms. Having a harness on your papillon maybe a safe way to hold onto them if picking them up but I do not like to leave collars on my papillons. My favorite type of collar I use has a quick release lock on it and I buy most of my collars and leashes from https://www.lupinepet.com/ . They have beautiful dog styles which help in dog training and have a great lifetime guarentee, which I have taken advantage of a few times! A veternarian once told me he has seen accidents and he never leaves a collar on his dog. I received this advice many years ago when two of our large dogs where playing together and the collar got stuck in the other dogs mouth and sufficated the one wearing the collar. It was tragic for all of us. so I do not leave collars on my papillons or larger dogs unless we are going out of the house or they are in our arms. Walking my dogs, dog parks, classes, or taking them out to go potty. I have placed a papillon in a loving wonderful home in alaska. That papillon was on leash going for a walk with her lovely owner. There was a German Shepard being walked by another owner, two girls. The Shepard saw the papillon and pulled loose from the owners hands and attacked the papillon and even the owner of the papillon and the other owners. The papillon was taken to emergency and treated and thank goodness survived and so did the owner of the papillon. Officials took the German Shepard away from the family. Another story I heard was a small dog was walking by a fenced area and a guard dog pulled the small toy breed into the fence area it was protecting. It did not have a chance! Police were called. I took an agility class and the teacher told me to be aware that large dogs look at papillons as if they are rabbits and will go after them so I was to keep my girl with me at all times and pick her up around the larger breeds. Not only do I worry about other dogs but I worry about Owls, Hawks, and Wildlife attacking them. I also have concerns on my dogs picking up a disease that a wild animal may have. Talk to your veternarian about what possiblities are out there including Giardia, Leptospirosis and canine influenza among other diseases. First - As the puppies are growing up Momma is feeding them with her milk. In a rare occasion I always advise to take a papillon puppy to Veterinary or Emergency Veterinary Service if symptoms papillon is showing are weak or latargic (hypoglycemic ) due to lack of food and was playing too long without food, or reaction to vaccine. Hill's Prescription Diet A/D Urgent Care moistened with water and given with a feeding syringe (needleless). I started feeding Nemo - Scooby Dooby Doo Forussi at the age of 13.5 yrs old , Primal Chicken Formula Nuggets Grain-Free Raw Freeze-Dried Dog Food and have discovered that he has alot more movement and energy. I currently feed my papillons Nutri Source - Lamb and Pea, with Pro-biotics and Pre-biotics. For now I really like the Nutri Source. I have been using it over a year and finding good results. 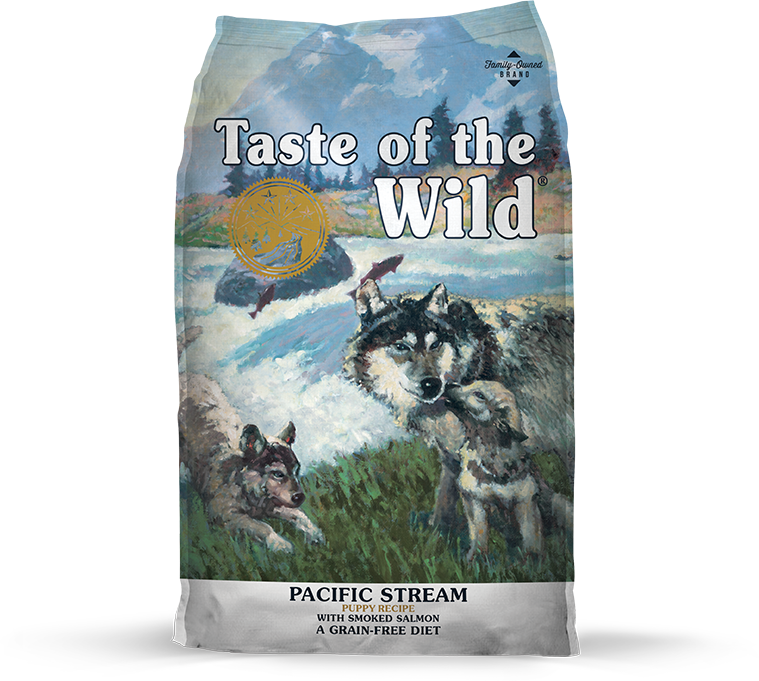 I used to use Taste of the Wild Pacific Stream - Grain Free Puppy Formula and have had no issues with it . Where Taste of the Wild was one of the better first developed Grain Free Diets, but now there are a larger variety of Grain free Diets where the companies are improving the formulas. These products are what I choose to use and recommend you discuss with your veterinarian if it's safe for your pet prior to purchasing any products I have listed on my page.
" Thorvin is one of the oldest and most powerful health food ingredients and natural supplements for pets. With more than 60 bioactive compounds, Thorvin belongs in your formula for glossy coats, clearer eyes, and optimal health. Thorvin kelp contains a complex array of bioavailable minerals, vitamins, and beneficial phytonutrients, which are important for healthy metabolic function including digestion, skin and coat health, and immune response. Thorvin works by filling in micronutrient deficiencies and balancing minerals. Thorvin is the preferred mineral supplement for pet formulations because it is entirely natural – harvested from the cleanest kelp beds on earth and dried at controlled low temperatures using geothermal energy. 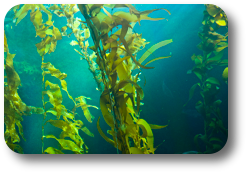 The most nutrient‐dense kelp on the market, Thorvin contains one‐third less moisture, 30% more iodine, and is the only kelp supplement with a guaranteed selenium claim. Blend Thorvin into pet food formulations, supplements, and functional treats. It only takes small amounts (0.25 to 1% of dry matter) to support optimal health. Pets Thrive on ThorvinSM "
"Camelina sativa is a flowering plant in the family Brassicaceae and is usually known in English as camelina, gold-of-pleasure, or false flax, also occasionally wild flax, linseed dodder, German sesame, and Siberian oilseed. It is native to Europe and to Central Asian areas. This plant is cultivated as oilseed crop mainly in Europe and in North America." 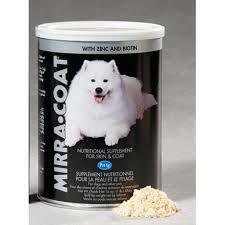 "Nutritional supplement for skin & coat. Recommended as a high potency nutritional supplement, which aids in correcting nutritional deficiencies and for maintenance of a beautiful skin and coat condition. Improvements are seen within 2 weeks of use. Mirra-Coat contains the following: Balanced Omega 6 & Omega 3 Essential Fatty Acids (EFA) – promotes cell membrane and nerve cell formation – improves skin barrier function. Both linoleic and linolenic acid. Optimal Organic oils (pesticide and solvent free). High levels of natural antioxidants and vitamins. Vitamin E complex (tocopherol and tocotrienol) which prevents cellular oxidation, balances vitamin A concentration and activates EFA metabolism. Vitamin A prevents plugged hair follicles. Vitamin B6 prevents dermatitis and hair loss and activates EFA and protein metabolism. No Vitamin D – excess vitamin D causes bone dysfunction – excess vitamin D causes soft tissue calcification. Zinc – prevents scaly dermatitis and hair lossactivates EFA and protein enzyme systems. Biotin – prevents scaly dermatitis and hair loss – improves hair color and luster – activates EFA and protein metabolism. High level of octocosanol, a potent energy source. Gamma-oryzanol for improved growth and better blood circulation."